THIS IS THE FIFTH PAGE of documents for the SECOND HALF of 1931 on Nicaragua's Caribbean Coast region, housing documents dated in the 46 days from November 16 to December 31. The year 1931 closes with a series of skirmishes between the EDSN & the Guardia in parts of the Coast's western frontier, but no large-scale offensive comparable to the spring’s. Claiming 800 men in arms “sobre nuestro litoral Atlántico” & to have captured the port of Prinzapolka and the Neptune & Pis Pis mines after brief firefights, the first document, a previously unpublished letter from Sandino to two lieutenants in Las Segovias, vastly exaggerates the size of the rebel army on the Coast & portrays a series of pyrrhic plundering raids as a string of decisive military victories (Nov 18). His next two letters (Nov 20 & 25), also unpublished till now and directed to Col. Perfecto Chavarria, leading the expedition down the Río Coco, congratulate him on his October victories, lament the deaths of Adolfo Cockburn and other heroes & martyrs, and try to smooth over Chavarria's apparently testy relationship with Gen. Simón González. 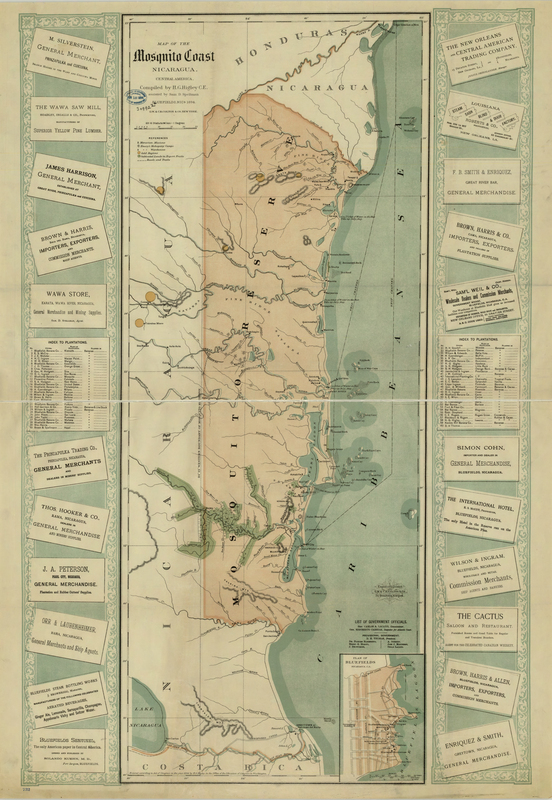 On the Guardia side, Col. Leech’s Record of Events in the Eastern Area for November (Dec 2) reports no military contacts with the enemy during the month & "no known bandits … in this Area … except, probably in the NW COCO RIVER region" — though he does anticipate a rebel offensive around Kisalaya & along the railroad inland from Puerto Cabezas, and beefs up key Guardia posts to meet it. A 29 November firefight between a Guardia & civico patrol under Lt. Rodríguez about 40 miles northeast of Neptune Mine results in a devastating defeat for the rebels, if we are to believe Lt. Rodríguez’s report (and there is no reason not to, though it was not typed up till Dec 14). A December 5th skirmish between “a small group” of rebels & a 10-man Guardia squad led by Lt. Stephenson on Waspan Creek south of Kisalaya further confirms Leech’s analysis (Dec 6). The receipt issued by Col. Abraham Rivera, Gen. Pedro Antonio Irías, & Gen. Simón González to Arab merchant Sebastian Ismael in Siuna shows not only the rebels’ location & actions at the time, but the patriotic framework used to morally legitimate their plundering of foreign properties (Dec 16; on the EDSN's mid-December Siuna raid, see the first document for 1932). By year’s end the rebels have vanished from the Guardia’s radar screen, as intelligence reports show that the rebel group under Pedrón, up to Dec 25 active around Siuna & Wuani & Tungla, has "completely disappeared" (31 Dec). Also meriting attention are the correspondences & reports of the Moravian Church (27 & 28 Nov and 16 & 31 Dec); the closing of the Bluefields newspaper Defensor de la Costa & the deportation of its editor Juan Ordóñez (Nov 25, Dec 1); and the intriguing letter from an anonymous informant to the manager of Bragmans Bluff Lumber Company (9 Dec). Report of the Suspension of the Newspaper Defensor de la Costa, Col. L. L. Leech, Bluefields, to Jefe Director GN Managua. "BLUEFIELDS, NICARAGUA ¶ 25 November, 1931. ¶ From: The Area Commander, Eastern Area. ¶ To: the Jefe Director, Guardia Nacional, Managua, Nic, ¶ Subject: Suspension of the newspaper Defensor de la Costa, Report of. ¶ Enclosure: (1) Copy of newspaper, Defensor de la Costa. ¶ 1. On November 21st, the Governor don Gilberto Lacayo, called upon me, with the enclosure, and pointed out the article headed “Angustiosa Situación” and requested that the paper be suspended. I agreed with him that the article was of a dangerous character, and told him I would send for the editor Dr. Ordoñez, and talk to him. Prior to my conversation with Dr. Ordoñez, and the order for the suspension, the Governor radioed the president in regard to the article, and received a return wire today. ¶ 2. In compliance with my request, Dr. Ordoñez appeared before me, and tried to justify the article on the grounds that papers in Managua and other places carried similar tirades, and that his idea was to arouse the public to a more united front against the bandits. I had been previously informed by a reporter of this paper, who recently left the employ of Dr. Ordoñez that the reason for his leaving was that a series of articles had been prepared, with which he couldn’t agree, and didn’t want to be connected with. In view of that knowledge and the inherent danger in the present article and those yet to be published, I directed Dr Ordoñez to suspend all further editions of his paper for an indefinite period. Copy of order attached. ¶ 3. The policy of the Jefe Director in such cases is requested that I may act accordingly. ¶ (signed) L. L. LEECH"
Message from Col. L. L. Leech, Bluefields, to Gen. C. B. Matthews, Jefe Director GN, Managua. "My dear General; The code message received by the Governor from the President in the case of Dr. Ordonez [Ordóñez] when decoded was in effect as follows: ¶ 'Quietly remove Dr. Ordonez to Panama.' ¶ The Governor is making the necessary arrangements and Dr. Ordonez will be given twenty four hours notice prior to the sailing of the vessel on which he will be put. The name of the vessel and the probable date of sailing is unknown at this writing. We are keeping the Presidents order secret until the time comes to carry it into effect." Letter from A. O. Danneberger, Bilwi, Nicaragua, to Brother Shimer, Moravian Church. Letter from A. O. Danneberger, Bilwi, Nicaragua, to Dr. S. H. Gapp, Moravian Church, Bethlehem PA. Message from Gen. C. B. Matthews, Jefe Director GN Managua, to Willard L. Beaulac, Chargé d'Affaires, US Legation, Managua. "I enclose herewith, for your information, copies of reports submitted by [Col. Leech] concerning the suspension of the newspaper "Defensor de la Costa", a Bluefields publication and the deportation of its editor, Dr. Juan Ordonez." Record of Events, Eastern Area, November 1931. Col. L. L. Leech, Bluefields, to Jefe Director GN Managua, p. 1. "2 December 1931 ¶ Subject: Record of Events, Eastern Area, NOVEMBER 1931. ¶ 3. Contacts: None in the period. ¶ The patrol operating on the COCO RIVER, at the end of last period, in command of First Lieutenant LEVONSKI, reached a point on this river about fifteen miles east of WASPOOK, when it was recalled and returned to PUERTO CABEZAS on November 10th. The patrol did not gain contact with the bandit group which it was seeking. This patrol was conducted with marked ability on the part of First Lieutenant LEVONSKI, and obtained valuable information, in confirmation of the effectiveness of Lieutenant SUPRENANT’S troops in contact last month. A checkup of all reports on the subject, considered together with the information submitted in Firs Lieutenant LEVONSKI’S patrol report make it possible to submit the following complete report on the results of that action: ¶ PLACE: LAIMUS ¶ PATROL COMMANDER: Lieut. Suprenant ¶ DATE: Oct 24 ¶ RESULTS: Bandit Casualties: Five (5) known killed; ¶ Eight (8) estimated dead; Total (8), Guardia: None. ¶ D. POLICE OPERATIONS. ¶ 1. See Departmental Reports. ¶ 2. General Police Conditions. Normal, = quiet. No major crimes or serious offenses or developments have been reported during the period. ¶ E. INTELLIGENCE. ¶ 1. The general state of the territory occupied has returned to its normal quiet status. No known bandits are in this Area, except, probably in the NW COCO RIVER region. ¶ 2. Military situation. With the probable return of bandit groups into the KISALAYA and RAILROAD LINE sections of Department of Northern Bluefields, in prospect, all posts in this department have been brought up to full enlisted strength, and to their full quota of automatic weapons and rifle grenade equipment. The new supply of automatic weapons was received from THE QUARTERMASTER, on October 31st." Record of Events, Eastern Area, November 1931. Col. L. L. Leech, Bluefields, to Jefe Director GN Managua, p. 2. "[...] Subject: Record of Events, Eastern Area, NOVEMBER 1931. ¶ 3. Economic conditions. One shipload of bananas was exported by independent growers during the period from the ESCONDIDO RIVER plantations. General conditions in this region, and RAMA, have therefore been bettered slightly. With this exception, the general economic situation is considered to be poor, with little, general change from the previous adverse reports. ¶ 4. No friction between Guardia and civil population has been reported to this office in NOVEMBER. The press’s attitude towards the service continues to remain friendly and favorable. ¶ 5. Political Situation. Very strong support to the Guardia Nacional, and very intelligent and calm management of the affairs of his administration continue to mark the tenure of Sr. Don GILBERTO LACAYO B., as Jefe Político. The Bluefields chapter of the Liberal political club, RIGOBERTO CABEZAS, supporting the SACASA ticket, has been formed. The officers of the Local branch of this organization are Señores Pastor Valle Quintero, Lotario Gómez and José Angel Romero Rojas. ¶ 6. Weather. Rains have decreased to moderate volume, and practically stopped. At the present time the weather is exceptionally clear and favorable for travel, a period termed locally as the “short dry season”. ¶ 7. Condition of telephone and telegraph communications. Civilian system – Tropical Radio Telegraph Co. = Excellent. KISALAYA Guardia radio = Very Good. NEPTUNE MINE: non-operative, since the date of arrival of Lieutenant (Radio) MC CLUNG, at NEPTUNE MINE, on October 11, 1931. ¶ F. CONFISCATION OF ARMS. See Departmental Reports. ¶ G. TRAINING. The schedules of military training have been carried out well during the period with special attention to preliminary rifle training exercises, and short practice hikes which included minor tactical elements, en route. [...]"
Record of Events, Eastern Area, November 1931. Col. L. L. Leech, Bluefields, to Jefe Director GN Managua, p. 3. "[...] Subject: Record of Events, Eastern Area, NOVEMBER 1931. ¶ H. MISCELLANEOUS. ¶ Colonel LEECH, Area Commander, inspected the District of Siquia, Department of Southern Bluefields, and found rapid progress being made in the demolition of the old Guardia Barracks, and construction of the new building. It is expected that the month of December will see the completion of the new barracks building, at RAMA, and the garrison established in their new quarters. ¶ Further efforts are being made in the Area to obtain a total of 30 new recruits from this coast, to make possible the establishment of the new post of WUANI. It is desired to obtain the necessary 30 from the Eastern coast, and thus avoid request for these men from the Western coast, and the transportation costs attending the transfers. ¶ Two American lumber men from Mobile, Alabama, cruised and prospected a region South of, and about fifty miles up the PRINZAPOLKA RIVER, and report that there is an extensive and excellent stand of pine and hardwoods in this region. These lumbermen intend to organize and finance a logging company and arrange for the exportation of timber to the United States, in the near future. ¶ (a) CIVICOS: Puerto Cabezas, 50; Neptune Mine, 53; El Gallo, 12; Bluefields, 65. ¶ (b) MUNICIPAL GUARDIA: Puerto Cabezas, 5; Bluefields, 9; Rama, 1. ¶ (signed) L. L. LEECH"
Report of Contact with Small Group of Bandits, 2nd Lt. Theodore M. Stephenson, Kisalaya, to Col. L. L. Leech, Bluefields, p. 1. "December 6, 1931. ¶ FROM: 2nd. Lieut. (P) Theodore M. Stephenson, G.N. ¶ TO: The Area Commander, Eastern Area, Bluefields, Nicaragua. ¶ VIA: The Department Commander, Department of Northern Bluefields, Puerto Cabezas, Nicaragua. ¶ Subject: Contact with small group bandits, report of. ¶ 1. Upon the receipt of information from Indians that a large group of bandits had crossed Laimus Creek and proceeded in an Easterly direction, myself and the following enlisted cleared Kisalaya to reconnoiter area down river: Sebastián Jimenez, Sgt. , G.N., Ricardo Mondragón, Raso, G.N. ; Juan Pantoja, Raso, G.N. ; Fernando Perez, Raso, G.N. ; Rosalío Canales, Raso, G.N. ; Federico Florez, Raso, G.N. ; Emilio Groniwald, Raso, G.N. ; Leonistine Omeir, Raso, G.N. ¶ 2. About one and one half miles south of Kisalaya patrol picked up trail of bandits proceeding in the direction of Waspán; patrol followed clearly defined trail to Waspán Creek, when it became evident that bandits had cut trail through dense underbrush towards the mouth of creek. Patrol followed and upon arriving within one hundred yards of the position taken by bandits, a warning was given them by someone some twenty-five yard from patrol with the firing of a pistol. Patrol approached with caution through dense underbrush and opened fire in the general direction of bandits. Upon arriving at the mouth of Waspán Creek, where it flows into the Coco River, a clearly defined target of five bandits were found in a pit-pan, attempting to escape towards the Coco River. Fire was immediately opened up on pit-pan, with the results that in their haste to escape pit-pan was overturned, and as they attempted to climb steep bank, three were killed and fell into the river. Patrol returned by same trail towards main trail to Waspán, and found bandit that had given signal badly wounded; we carried wounded bandit in the savannas, some hundred yards [...]"
Report of Contact with Small Group of Bandits, 2nd Lt. Theodore M. Stephenson, Kisalaya, to Col. L. L. Leech, Bluefields, p. 2. "[...] from main trail; his pistol was still in his hand. Myself and Sgt. Jimenez questioned him, and his answers are herewith attached, in as far as I am able to recall from memory. ¶ 3. 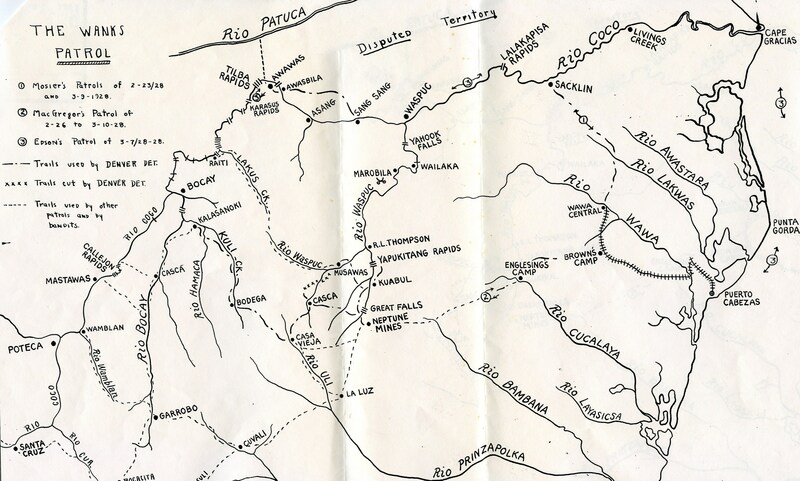 While Indians reported a large group had crossed Laimus Creek, patrol found upon investigation no more than a group of fourteen under Chavarría, who offered but slight opposition and little leadership. At the completion of questioning patrol cleared towards Sáupuca, but did not again gain contact with bandits. Laid ambush near Kum, but bandits did not come near. ¶ 4. The conduct of this patrol was all that could be required under the circumstances. ¶ Theodore M. Stephenson ¶ DEPARTMENT OF NORTHERN BLUEFIELDS, GUARDIA NACIONAL DE NICARAGUA PUERTO CABEZAS NICARAGUA ¶ 4 January 1932. ¶ 1st. endorsement ¶ From: The Department Commander. ¶ To: The Area Commander, Eastern Area, Guardia Nacional de Nicaragua, Bluefields, Nicaragua. ¶ Subject: Contact report of. ¶ Enclosures: 1. Statement of Rosalío López. ¶ 1. Forwarded herewith is a contact report of Lieutenant Stephenson. ¶ 2. This report was just received by mail from Cabo Gracias via the schooner “Elk”. It is presumed that this report laid over in Cabo Gracias or in some town on the Wanks River. No prior information has been received regarding this affair. ¶ C. A. INMAN [...]"
Report of Contact with Small Group of Bandits, 2nd Lt. Theodore M. Stephenson, Kisalaya, to Col. L. L. Leech, Bluefields, p. 3. "[...] 2nd. Endorsement ¶ HEADQUARTERS EASTERN AREA GUARDIA NACIONAL DE NICARAGUA ¶ Bluefields, Nicaragua. 8 January 1932. ¶ From: The Area Commander, Eastern Area. ¶ To: The Jefe Director, Guardia Nacional, Managua, Nicaragua. ¶ Subject: Contact, report of. ¶ 1. Forwarded. ¶ 2. Further steps are being taken to find out why this contact was not reported, in detail, by radiogram. ¶ 3. 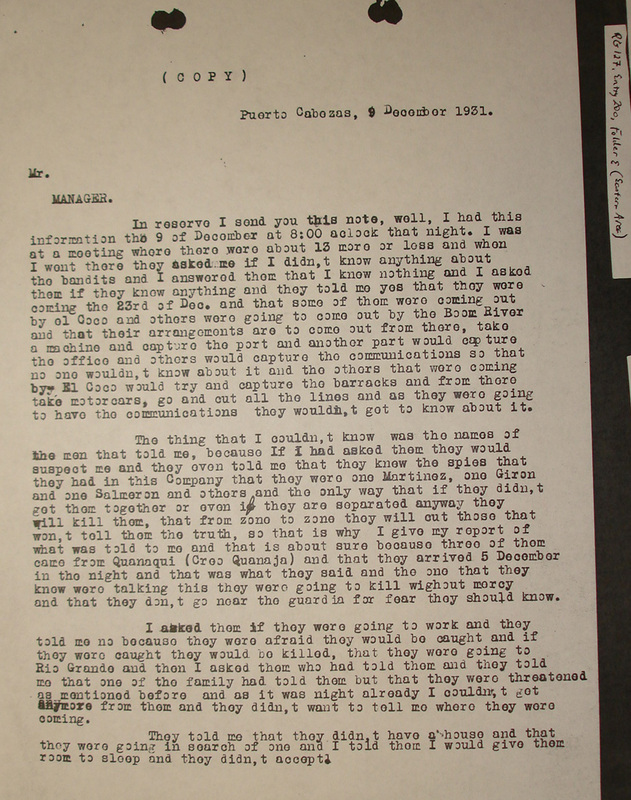 The only information received in this office on this subject was received by “NOTE”, that is, a personal message between the two civilian radio operators of Puerto Cabezas and Bluefields. This “NOTE” was received on December 5, 1931 and is quoted herewith:= ¶ COL. LEECH = FOR YOUR INFORMATION:= ¶ “PTO. CABEZAS SAYS KISALAYA INFORMS HIM THAT PATROL THAT WENT OUT DID SOME FIRING ABOUT MILE OR SO SOUTHEAST OF KISALAYA PLANES COMING UP A LITTLE LATER. NO FURTHER DETAILS YET. ¶ BOWKER. ¶ 4. This unofficial information was transmitted to the Jefe Director in my 12005 December 1931, quoted herewith: ¶ BLUEFIELDS DECEMBER 5 1931. ¶ JEFE DIRECTOR GUARDIA MANAGUA. ¶ MY 11201 PUERTO CABEZAS CIVILIAN RADIO OPERATOR REPORTS KISALAYA PATROL IN CONTACT ABOUT ONE MILE SOUTHEAST OF KISALAYA PLANES OPERATING WITH PATROL 12005. ¶ LEECH ¶ 5. This information was considered so important by the operator in Puerto Cabezas that it was transmitted to this office, deadhead, but no official report was received from the Guardia in Puerto Cabezas. ¶ (signed) L. L. LEECH [...]"
Report of Contact with Small Group of Bandits, 2nd Lt. Theodore M. Stephenson, Kisalaya, to Col. L. L. Leech, Bluefields, p. 4. "[...] First Endorsement. ¶ HEADQUARTERS EASTERN AREA GUARDIA NACIONAL DE NICARAGUA ¶ Bluefields, Nicaragua 14 January 1932. ¶ From: The Area Commander, Eastern Area. ¶ To: The Jefe Director, Headquarters, Guardia Nacional de Nicaragua, Managua, Nicaragua. ¶ Subject: Failure to report Kisalaya contact, (December 5, 1931, Department of Northern Bluefields) ¶ 1. Forwarded. ¶ 2. The basis letter is in reply for requirement that an explanation be forwarded to this office for failure to report the Lieutenant STEPHENSON, KISALAYA contact, by radiogram, on December 5, 1931 (1932?) ¶ (signed) L. L. LEECH [...]"
Report of Contact with Small Group of Bandits, 2nd Lt. Theodore M. Stephenson, Kisalaya, to Col. L. L. Leech, Bluefields, p. 5. "[...] DEPARTMENT OF NORTHERN BLUEFIELDS ¶ GUARDIA NACIONAL DE NICARAGUA ¶ PUERTO CABEZAS, NICARAGUA. ¶ 12 January 1932. ¶ From: Department Commander. ¶ To: Area Commander. ¶ Subject: Failure to report Kisalaya Contact of 5 Dec. 1931. ¶ 1. On the morning of 5 December 1931, First Lieutenant Peterson, who was then acting as Department Commander received information from the radio operator of this Port that Kisalaya reported Lieut. Stephenson with a patrol on the trail of some bandits reported in the vicinity of Saupuka and that shots had been fired in that direction. The planes immediately left for Kisalaya with Lieut. Peterson as observer. Effort was made to pick up the patrol both going to and returning from Kisalaya but without avail. They were also informed by Lieut. Suprenant that no further information had been received from Stephenson’s patrol. The planes returned to Port, gassed and took off again to scout the area between Saklín and Kisalaya. At about 1600 Stephenson’s patrol was picked up just south of Saklín and traveling towards that place. Two messages were received from the patrol “where are the bandits?” and, “nothing to report”. The planes then returned to Port. No other mention of the contact reached this Department until the receipt of the written report which arrived here via Cabo Gracias the first part of this month. ¶ 2. Lieutenant Stephenson states that he sent a radio (message) upon his return stating “Contact report in mail”. There is no record of this radio either in the Commandancia or the local radio station. Mr. Krog, the local operator here, informs me that a great many schedules with Kisalaya have been broken off before completion due to weakness of radio set, other stations cutting in or due to lack of time but they are generally picked up on the next schedule. I have asked the Port operator and Kisalaya to keep a complete file of all messages both sent and received in order to check with our files here. (signed) O. 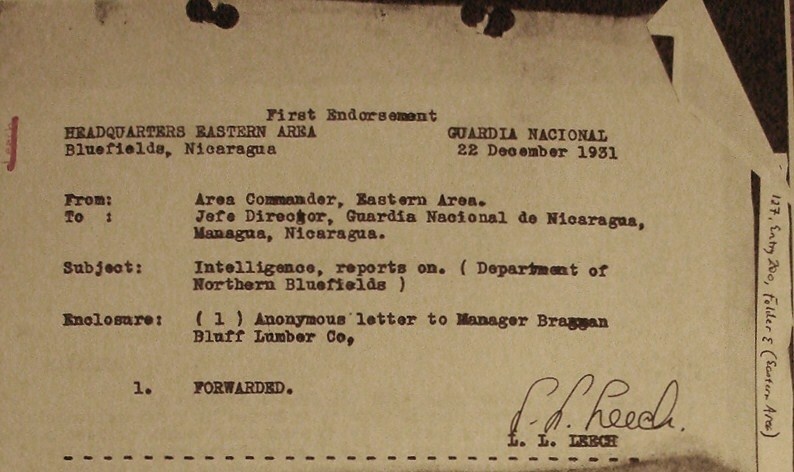 A. INMAN"
Letter from Anonymous, Puerto Cabezas, to Manager Bragmans Bluff Lumber Co., Puerto Cabezas, with Endorsement by Col. L. L. Leech, Bluefields (2 images). 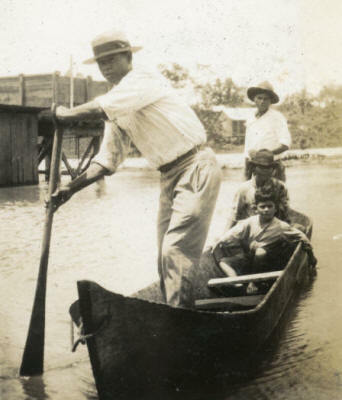 "(COPY) ¶ Puerto Cabezas, 9 December 1931. ¶ Mr. MANAGER. ¶ In reserve I send you this note, well, I had this information the 9 of December at 8:00 o’clock that night. I was at a meeting where there were about 13 more or less and when I went there they asked me if I didn’t know anything about the bandits and I answered them that I know nothing and I asked them if they know anything and they told me yes that they were coming the 23rd of Dec. and that some of them were coming out by el Coco and others were going to come out by the Boom River and that their arrangements are to come out from there, take a machine and capture the port and another part would capture the office and others would capture the communications so that no one wouldn’t know about it and the others that were coming by El Coco would try and capture the barracks and from there take motorcars, go and cut all the lines and as they were going to have the communications they wouldn’t get to know about it. ¶ The thing that I couldn’t know was the names of the men that told me, because if I had asked them they would suspect me and they even told me that they know the spies that they had in this Company that they were one Martínez, one Girón and one Salmerón and others and the only way that if they didn’t get them together or even if they are separated anyway they will kill them, that from zone to zone they will cut those that won’t tell them the truth, so that is why I give my report of what was told to me and that is about sure because three of them came from Quanaqui (Creo Quanaja) and that they arrived 5 December in the night and that was what they said and the one that they know were talking this they were going to kill without mercy and that they don’t go near the guardia for fear they should know. ¶ I asked them if they were going to work and they told me no because they were afraid they would be caught and if they were caught they would be killed, that they were going to Rio Grande and then I asked them who had told them and they told me that one of the family had told them but that they were threatened as mentioned before and as it was night already couldn’t get anymore from them and they didn’t want to tell me where they were coming. ¶ They told me that they didn’t have a house and that they were going in search of one and I told them I would give them room to sleep and they didn’t accept." Report of a Contact with a Group of Armed Bandits, 2nd Lt. J. B. Rodriguez, Neptune Mine, to Col. L. L. Leech, Bluefields, p. 1. "DEPARTMENT OF NORTHERN BLUEFIELDS, GUARDIA NACIONAL. ¶ NEPTUNE MINE, NICARAGUA. 14 December 1931. ¶ From: 2nd Lt. J. B. Rodriguez, G.N. ¶ To: Area Commander, Eastern Area, Bluefields, Nicaragua. ¶ Subject: Report of a contact with a group of armed bandits. ¶ 1. The following is a report of a contact held at 40 miles from the Neptune Mine, to the northeast, at 10:00 am. 29 November 1931: ¶ STATION OF THE PATROL: Neptune Mine, Nicaragua. ¶ MISION OF THE PATROL: To seek and destroy a group of bandits who were marauding around that vicinity and stealing the cattle, the bandits reported in the section of Sulún. ¶ DATE AND HOUR OF THE CONTACT: The contact was a regular combat which lasted about half an hour. ¶ NAME OF THE CHIEF, GUARDIAS NACIONALES AND CIVICOS INVOLVED: Mr. Arturo Pineda, in charge of the Cívicos. Cpl. Martínez, Carlos, G.N. # 1849; Raso Alaniz, Gumercindo, G.N. # 3084; Raso Garzón, Jesús, G.N. # 4809; Raso Fernandez, Narciso, G.N. 3 4745; Raso Sánchez, José, G.N. # 4791; ¶ CIVICOS: Bustillo, Humberto; Castrillo, Adolfo; Kiambel, Carlos; Espinosa, Francisco; Guerrero, Juan; Iglesias, Ignacio; Rizo, Sabino; Urbina, Ildefonso. ¶ NUMBER OF BANDITS INVOLVED: This group consisted of 25 bandits, armed with rifles. ¶ CASUALTIES: Guardia: NONE. ¶ Bandits: Five killed who were identified. But many more were killed by the fire of the Browning, about 20, who were in pit-pans on the river at the time of the contact. They tried to escape on hearing the first shots, but were taken by surprise by the machine gun fire which was handled by Raso Alaniz, Gumercindo, who observing that they were escaping in the pit-pans destroyed same with the machine gun also killed the armed bandits who were in the pit-pans. These bandits fired too from the boats, but were drowned in the river. It is believed that all these bandits were the ones who used the house of Pedro Leon, Juez [...]"
Report of a Contact with a Group of Armed Bandits, 2nd Lt. J. B. Rodriguez, Neptune Mine, to Col. L. L. Leech, Bluefields, p. 2. "[...] de Mesta of Sulún, who also died in the contact. This man Pedro León was commissioned as Juez de Mesta of Sulún by the General of the bandits, Augusto C. Sandino. ¶ WEAPONS EMPLOYED BY THE PATROL: ¶ 1 BAR., with 400 rounds, 200 of which were expended in the contact. 18 Krag rifles with 1800 rounds, 250 rds. Expended. Only the machine gun was used as the bandits tried to escape via the river in pit-pans. The bandits had no automatic weapons, only rifles of different kinds. Five dead of the bandits were identified and captured four rifles: 1 Winchester with 16 rds. One shotgun w.10 rds. And 2 old muzzle loading rifles with a can of powder, 20 detonators and 2 machetes. The camp was destroyed, also 45 quintals of beans, 20 quintals of rice and about 50 quintals of corn, food of the bandits. One house at the side of the camp was also destroyed. Indians from Sulún came and reported that they have seen floating on the river several bodies, for which reason it is believed that all the bandits who were in the pit-pans died. When they were under the fire of the machine gun nobody of them got away from the water. I recommend the members of this patrol including the Cívicos who were very courageous. It (is) also believed that bandit jefe Chavarría died in this contact as he was the jefe of this group. I, personally, want to make a patrol around the vicinity of Siuna as it is reported that by that side there is a group of bandits stealing cattle, I await orders. ¶ 2. Copy of this report sent to the Commanding Officer, G.N. Puerto Cabezas, Nic. ¶ /a/ J. B. Rodriguez, ¶ 2nd Lt., G.N.[...]" Report of a Contact with a Group of Armed Bandits, 2nd Lt. J. B. Rodriguez, Neptune Mine, to Col. L. L. Leech, Bluefields, p. 3. "[...] First Endorsement ¶ HEADQUARTERS EASTERN AREA GUARDIA NACIONAL DE NICARAGUA ¶ Bluefields, Nicaragua 22 December 1931. ¶ From: Area Commander, Eastern Area. ¶ To: The Jefe Director, Headquarters, Guardia Nacional de Nicaragua, Managua. ¶ Subject: Contact report with a group of armed bandits, (SULUN = Neptune Mine region) ¶ Enclosures: (3) Captured “Abram Rivera” papers. (1) Envelope. ¶ 1. Forwarded. It is noted that the Rivera appointed Juez was apparently killed, and that Lieutenant Rodríguez “believes” that Chavarría must have been killed in the action. ¶ (signed) L. L. LEECH [...]"
Report of a Contact with a Group of Armed Bandits, 2nd Lt. J. B. Rodriguez, Neptune Mine, to Col. L. L. Leech, Bluefields, p. 4. "[...] DEPARTAMENTO DEL NORTE DE BLUEFIELDS. ¶ GUARDIA NACIONAL DE NICARAGUA. ¶ MINA DE EL NEPTUNO NICARAGUA. ¶ 14 de Dic. De 1931. ¶ Del: 2nd. Lieut. J.B. Rodríguez, G.N. ¶ Al: Comandante del Area del Este, Bluefields, Nic. ¶ Asunto: Reportaje de Contacto con un grupo de Bandoleros Armados. ¶ 1. El Siguiente reportaje de un Contacto, que aconteció como a 40 millas de la Mina Neptune, al Noreste de la Mina Neptune, a las 10:00 del 29 de Nov. De 1931. ¶ ESTACION DE LA PATRULLA Mina Neptune Nicaragua. ¶ MISION DE LA PATRULLA: La Patrulla fue enviada para perseguir a una Cuadrilla de forajidos que merodeaba por ese lugar robándose el Ganado que existía en el lado de Sulún. ¶ FECHA Y HORA DEL ENCUENTRO: 29 de Nov. De 1931, a las 10:00 de la mañana. ¶ DURACION DEL ENCUENTRO: ¶ El encuentro fue un combate corriente que duró alrededor de media hora. ¶ NOMBRES DEL JEFE: Y DE LOS GUARDIAS NACIONALES, Y GUARDIAS CIVILES, QUE TOMARON PARTE. ¶ Coronel: Arturo, Pineda, encargado de la Patrulla. Cabo: MARTINEZ, Carlos, # 1849, G.N. ; Rasos: ALANIZ, Gumercindo, # 3084, G.N. ; GARZON, Jesus, # 4809, G.N. ; FERNANDEZ, Narciso, # 4745, G.N. ; SANCHEZ, José, #4791, G.N. ¶ GUARDIAS CIVILES: ¶ BUSTILLO, Humberto; CASTRILLO, Adolfo; KIAMBEL, Carlos; ESPINOZA, Francisco; GUERRERO, Juan; IGLESIAS, Ignacio; RIZO, Sabino; URBINA, Ildefonso. [...]"
Report of a Contact with a Group of Armed Bandits, 2nd Lt. J. B. Rodriguez, Neptune Mine, to Col. L. L. Leech, Bluefields, p. 5. "[...] NUMERO DE BANDIDOS QUE TOMARON PARTE: ¶ Este grupo consistió en número de 25 hombres, armados con rifles. ¶ BAJAS: ¶ GUARDIAS: Ninguno. ¶ BANDIDOS: Cinco, los que fueron identificados. Más fueron despedazados por la Ametralladora Browning , como 20 hombres, poco mas ó menos, que iban en unos pipantes en el momento del combate, ellos acudieron a la fuga, en los primeros tiros pero fueron sorprendidos por la ametralladora que manejaba el Raso ALANIZ, Gumercindo, quien al verlos zarpar sobre las corrientes del río, hizo pedazos los Pipantes, juntamente con los tripulantes lo cual todos eran Bandoleros, porque todos iban armados y haciendo fuego desde los referidos pipantes. Se cree pues que dichos bandidos todos fueron ahogados, juntamente con las armas que poseían. Y por esa razón se cree que todos los bandoleros que se encontraban en Sulún en casa de Pedro León, Juez de la Mesta, puesto por el General en Jefe, Augusto C. Sandino, lo cual el dicho Juez de la Mesta también fue muerto en la tragedia del 29 de Nov. P.P. ¶ ARMAS USADAS POR LA GUARDIA EN EL ENCUENTRO: 1 Rifle Automático Bonig, con 400 T. (tiros) los cuales fueron gastados 200 en el combate. ¶ 18 Rifles Krag, con 1800 tiros, los cuales fueron gastados 250 porque la Máquina se ocupó solamente cuando ellos se querían escapar en los pipantes ; ellos no tenían ametralladoras, solamente rifles de todas las clases; fueron identificados 5 muertos de parte de los bandoleros, y 4 Rifles el cual fueron 1 Winchester Cal. 38 con 16 Cartuchos. ¶ 1 Escopeta cal. 15 con 10 Cartuchos y 2 Chepos con un pote de Pólvora de una libra, y 20 fulminantes, y 2 Machetes. ¶ El Campamento fue debidamente destruído, juntamente con 45 quintales de Frijoles, que en el existían, y 20 quintales de Arroz, y como 50 quintales de Maiz, de los cuales ellos se alimentaban; la Casa junto con lo que en ella se encontraban fue debidamente destruída. Vinieron unos Indios del lado de Sulún, y dijeron de que habían visto pasar por el río unos cadáveres a flote y se cree por esa razón de que todos los que iban en los Pipantes hayan perecido, por que cuando la máquina los estaba batiendo ninguno se vió salir del agua. ¶ Así es pues que yo recomiendo a los guardias que tomaron parte en ese combate y a los Guardias Civiles, porque se portaron muy valientes contra el enemigo, se cree que el Cnel. Chavarría haya perecido en ese encuentro porque era el que comandaba dichas fuerzas ; yo personal quiero hacer una comisión al lado de Siuna porque dicen que por ahí anda otro pelotón de bandoleros en busca de reses. ESPERO SUS ORDENES. 1. Copia al Comandante de Puerto Cabezas, G.N. ¶ (firma) J. B. Rodriguez ¶ 2nd Lt. G.N. ¶ Comandante de la Mina Neptuno, Nic. [...]"
Report of a Contact with a Group of Armed Bandits, 2nd Lt. J. B. Rodriguez, Neptune Mine, to Col. L. L. Leech, Bluefields, p. 6. "[...] First Endorsement ¶ HEADQUARTERS EASTERN AREA GUARDIA NACIONALDE NICARAGUA ¶ Bluefields, Nicaragua 22 December 1931. ¶ From: Area Commander, Eastern Area. ¶ To: The Jefe Director, Headquarters, ¶ Guardia Nacional de Nicaragua, Managua. ¶ Subject: Contact report with a group of armed bandits, (SULUN= Neptune Mine region) ¶ Enclosures: (3) Captured “Abram Rivera” papers. (1) Envelope. ¶ 1. Forwarded. It is noted that the Rivera appointed Juez was apparently killed, and that Lieutenant Rodriguez “believes” that Chavarría must have been killed in the action. ¶ L. L. LEECH [...]"
Report of a Contact with a Group of Armed Bandits, 2nd Lt. J. B. Rodriguez, Neptune Mine, to Col. L. L. Leech, Bluefields, p. 7. "[...] DEPARTMENT OF NORTHERN BLUEFIELD ¶ GUARDIA NACIONAL DE NICARAGUA ¶ PUERTO CABEZAS, NIC. NEPTUNE MINE DET. 14 DECEMBER 1931 ¶ From: 2nd Lt. J. B. Rodriguez, G.. ¶ To: The Area Commander, Eastern Area, Bluefields, Nic., ¶ Subject: Contact report with a group of armed bandits. ¶ 1. The following report of a contact which took place about 40 miles from Neptune Mine, Northeast at 10:00 AM of the 29 of November 1931. ¶ STATION OF PATROL: Neptune Mine, Nicaragua. ¶ MISSION OF PATROL: The patrol was sent to capture a group that was marauding around that place (Sulun) stealing cattle. ¶ DATE AND HOUR OF CONTACT: 29 November 1931 at 10:00 in the morning. ¶ DURATION OF CONTACT: The Combat was very short which lasted about half an hour. ¶ NAME OF JEFE AND NATIONAL GUARDIAS AND CIVIL GUARDIAS WHO TOOK PART IN CONTACT: (Colonel) Arturo Pineda, (in charge). Cabo MARTINEZ, Carlos # 1849, GN; ¶ Rasos: ALANIZ, Gumercindo #3084, GN; GARZON, Jesus #489, GN; FERNANDEZ, Narciso #4745, GN; SANCHEZ, Jose #4791, GN; ¶ Civil Guardias: Humberto BUSTILLO, Adolfo CASTRILLO, Carlos KIAMBEL, Francisco ESPINOZA, Juan GUERRERO, Ignacio IGLECIAS, Sabino RIZO, Ildefonso URBINA. [...]"
Report of a Contact with a Group of Armed Bandits, 2nd Lt. J. B. Rodriguez, Neptune Mine, to Col. L. L. Leech, Bluefields, p. 8. "[...] NUMBER OF BANDITS THAT TOOK PART. ¶ This group consisted of 25 men armed with rifles. ¶ DEAD: GUARDIAS: NONE ¶ BANDITS: Five were identified. ¶ Moreover it is believed that about 20 more men more or less were drowned because when the combat started they were trying to make their escape in the pitpans when Raso ALANIZ, Gumercindo opened the Browning on them and the pitpans were torn to pieces and all of the men that were in there and who were all bandits because when fire was opened upon them they fired back went down the river with their arms they carried for that reason it is believed that all the bandits who were at Sulun in the house of Pedro Leon, Juez de Mesta, appointed by General Augusto C. Sandino were drowned, in which the said Juez de Mesa also died in that tragedy of the 29th Nov. past. ¶ ARMS USED BY THE GUARDIAS IN THE CONTACT. ¶ 1 Automatic Rifle Browning with 400 rounds. 200 rounds were used in the contact. ¶ 18 Rifles Krag with 1800 rounds. 250 rounds were used in the contact, The Machine occupied only when they were trying to escape in the pitpans. They did not have machine guns, only rifles of all sorts. 9 dead were identified, in part of the bandits, and four rifles, 1 Winchester Cal. 38 with 16 shells. 1 Shotgun Cal. 16 with 10 shells, 2 Loading Shotguns with 1 tin of powder containing 1 lb. and 20 percussion caps and 2 Machetes. ¶ The camp was completely destroyed together with 45 quintal of Beans. 20 quintal of Rice and about 50 quintal of Corn which they fed on . The house and all that was found in there was completely destroyed. Some Indians from the side of Sulun came and they said that they saw dead bodies floating down the river and that is why I think that all those that were going in the Pitpans must of perished, because when the machine was shooting at them none was seen to come out on the water. For that reason I can recommend you all the guardias that took part on that combat as well as Civilian guardias, they acted very brave against the enemy. It is believed that Colonel Chavarria must of perished in that combat because he was the one that commanded that force. Personally I want to go on a commission around Siuna because they say another group of bandits are around that way. (AWAITING YOUR ORDERS). ¶ 1 Copy to Department Commander, Puerto Cabezas. ¶ J.B. Rodriguez, ¶ 2nd Lt. G.N. ¶ Commanding Neptune Mine Det." Letter from C. Conrad Shrimer, Bluefields, to Dr. S. H. Gapp, Moravian Church, Bethlehem PA, p. 1. "MORAVIAN MISSION ¶ CENTRAL AMERICA ¶ Bluefields, Nicaragua December 16, 1931 ¶ Dear Brother Gapp, This is rather a tardy acknowledgement of your letters of November 13th and 20th, but there was nothing that called for an immediate reply. ¶ I have sent out a circular to the missionaries concerned asking them for a statement of their losses during the recent trouble. I did not know that Sr. Bregenzer had collected so much money from the congregations, and agree with your Board that in view of this there is no need to turn over to her the money collected for the relief of the missionaries here. ¶ It is more than likely that the claim for damages from Brother Schramm will be heavy for he violated instructions and left his goods at Sangsangta. I told him to bring his goods to Bluefields, for P.B. was already then of the opinion that if he should return to the country he would not go back to the Wangks river. But, as he usually did, he acted on his own judgment and left his boxes, there, with the result that he lost much of his property. ¶ So far as I know, Miss Kreitlow lost nothing except some wear and tear on her nerves. However I have written to her for information in case she should have had some loss. ¶ The missionaries were not consulted about the ten per cent cut in salaries. There was nothing else to be done if we were to keep within the budget, so P.B. acted. You said in your letter of the 20th of November that Brother Schramm might turn up here. He will be taken care of until such time as he can get away, although I will not say I would relish such a visit. You said also that he was not surprised that there was no provision made for him in the new budget. He knows very well what he has done, and could therefore expect nothing else but to be dropped. ¶ Brother Danneberger writes under date of November 30th: ¶ “The complete destruction of our Sumu settlement (Tuberus) is a fact. The bandits got there about ten days after we had left. The Sumus heard of their approach and had fled with their boats downstream. The bandits did not only burn down every house including our church and the evangelist’s house, but they also killed most of the animals and ruthlessly cut down coconut and orange trees. Two Sumus came and gave me the report. This morning I went to the Commandancia and to the office of the Bragman Bluff Lumber Company and spoke with them about a new settlement [...]"
Letter from C. Conrad Shrimer, Bluefields, to Dr. S. H. Gapp, Moravian Church, Bethlehem PA, p. 2. "[...] Bluefields, Nicaragua, December 16th, 1931. ¶ To ¶ Rev. Dr. S. H. Gapp, ¶ 69 West Church Street, ¶ Bethlehem, Penna, U.S.A. #2 ¶ [...] of the Tuburus people somewhere near the railway line. I hope we will succeed in finding a new home for the terrified and homeless people. Apparently the Sumus had fled from the approaching bandits fearing that they would be forced into their service and be used as “cannon fodder” in an eventual battle.” ¶ The gist of this paragraph can be published in the “Moravian”, but put in nothing that we are making an effort to find a new home for the people. ¶ With best wishes for a Happy Christmas, ¶ Fraternally yours, ¶ (signed) C. Conrad Shimer, ¶ Acting Superintendent." Intelligence, Col. L. L. Leech, Bluefields, to Jefe Director GN Managua. "GUARDIA NACIONAL DE NICARAGUA ¶ CUARTEL GENERAL, AREA DEL ESTE ¶ Bluefields, Nicaragua, 17 December, 1931. ¶ From: The Area Commander, Eastern Area. ¶ To: The Jefe Director, Guardia Nacional, Managua. ¶ Subject: Intelligence. ¶ 1. A woman from Puerto Cabezas came in this morning and stated that the bandits will attack Puerto Cabezas in force in two columns on Christmas Day, one column from the north east and one along the beach from Tuapi. That bandit scouts had entered there to note the guardia strength, and positions and arranged with the malcontents and other people employed by the Company to strike at the same time. ¶ 2. Just how much reliance is to be placed in the woman’s story is hard to say. When Darrrah was there he was a very good friend of this woman, and claimed to have gotten considerable valuable information from her, and records on file indicate that he predicted the Logtown occurrences two months ahead. I am forwarding the information to Inman, and directing him to take proper precautions, and to seek in every way for information. I will have a detachment standing by here for immediate dispatch should later information warrant it. ¶ 3. Recent events around Kisalaya and reports that a movement eastward South of Kisalaya of a large well organized force, lend evidence to the woman’s story, and an attack on Puerto Cabezas is considered a possibility. All contact with the bandits has been lost, and in that country a concentration before Puerto Cabezas could be easily and secretly made, for it is almost impossible o get the natives to give information. ¶ (signed) L. L. LEECH"
Smuggling of Arms, Ammunition & Provisions into Nicaragua via Caratasca Lagoon & Patuca River, Capt. O. A. Inman, Puerto Cabezas, to Jefe Director GN Managua. "DEPARTEMENT OF NORTHERN BLUEFIELDS ¶ GUARDIA NACIONAL DE NICARAGUA ¶ PUERTO CABEZAS NICARAGUA ¶ 19 December 1931. CONFIDENTIAL ¶ From: The Department Commander ¶ To: The Jefe Director, Guardia Nacional, ¶ Managua, Nicaragua. ¶ Via: The Area Commander, Eastern Area, Guardia Nacional, Bluefields, Nicaragua. ¶ Subject: Smuggling of arms, ammunition and provisions into Nicaragua via Caratasca Lagoon and Patuca River, Honduras. ¶ Enclosure: 1. Letter from J. D. Flannery, Manager Bragman Bluff Lumber Company. ¶ 1. Constant reports are coming in to Cabo Gracias by Indians that there are a band of from fifty to seventy-five bandits situated in the area of Caratasca Lagoon, Mouth of the Patuca River and Honduranian Cruta. They claim these bandits are there to look after arms and ammunition being smuggled into the Lagoon and thence up the Patuca River to Sandino’s Quarters. Several attempts have been made by the Guardia at the Cape to send up spies into that country but no direct information has been obtained. ¶ 2. Mr. Downing, Customs Collector of this Port, informed me today that on the first of December a three masted schooner was sighted coasting up and down off the coast of Cruta. The suspicious appearance of this vessel caused a report to be made to the Customs Officials at Cabo Gracias who immediately investigated. No trace of the vessel was found, but on the beach of Caratasca Lagoon two life preservers marked: “M.B.” and two drums of gasoline were found. The Nicaraguan Comandante at Cruta after an investigation reported to the Customs officials that from information received he was positive that the vessel landed arms and ammunition also. As soon as the Guardia can get in touch with this Comandante more thorough information will be given. ¶ 3. Repeated attempts have failed to ascertain the exact number of these bandits, or who their Jefe is. 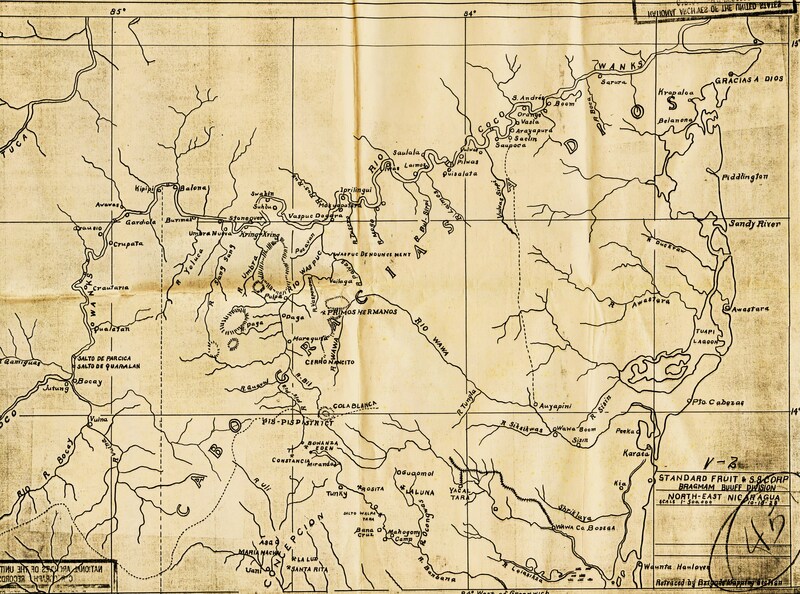 The Indians on the upper Coco River state freely that Sandino is constantly transporting arms and ammunition up the Patuca River, through Sang Sang on the Coco River and thence to his stronghold. This route has been used mainly since the establishment of the post at Kisalaya. Before, the main route was overland from the Patuca River to Sawa Boom on the Coco River and thence via Coco to the Segovias. (signed) O. A. INMAN"
Letter from Juan Camilio Torres, Prinzapolka, to Sister Sra. Felipe Reyes (2 images). [SOURCE: GN-2 Report of 1 Feb. 1932, covering Jan. 1932, pp. 7-8.] "Prinzapolka, 27 December 1931. ¶ Mrs. Felipe Reyes: ¶ Appreciated Sister: ¶ After saluting Gilpoloi, Carlitos and Rosarito, I arrived as far as Soledad because I met Ismael Vendier who was running away from the troops of General Altamirano and other Generals and companions and they say it is 371 men in all. They carried away all the cattle and didn’t leave any goods, clothes, salt or matches so I returned to Prinzapolka. They were going well equipped and plenty of machine guns and rifles. Today I am leaving for Wauni again, I will return soon. Regards to Soledad and the children. Among other things that were done in Wauni and Siuna it is said that they killed Mr. Pedro Duartes, Charlie Haslam and your compadre and Joaqin Acosta. In Wauni and Siuna [p. 8] it is said that they killed a woman who is said to be Emilia Reyes but they think that this is not true. About the other dead, they say that it is true. ¶ This is all your brother tells you, ¶ Juan CamilioTorres." Exerpts from Report of Haulover and its Filials for the Year Ending December 31, 1931, J. A. Fisher, Moravian Church, p. 1. "[...] 9. Several others were also sick but got better. The closing down of the B.B.L. Co. activities has been felt by our people of this village, but it is not an exaggeration to say had not said Co. kept on still loading bananas every week though we are sorry its being done on Sundays, causing much increase in Lord’s Day desecration and a chief factor in small attendances at Church most likely several of the Indians from here up would have a hard time for what to eat. Karata.—Comes a very close second in everything but one: Among say a third of the female members there is a bad unchristian habit is on account of hearsay stories—to quarrel using plenty of abusive language and do not speak to one another for the which reason and upholding their daughters under their roofs immoral living, not even civilly married, so that at the last Communion about half dozen was disciplined. ¶ During the year however 16 were confirmed, 11 re-amitted, 2 adults and 12 children baptized. Four couples married, three deaths; and nine removed to another congregation, whilst ten came to this—these 2 items means whole families viz. Adrian and his family to Layasiksa, whilst from the Wangks district came Ignatius Maibit and his family. A community school is in operation but does not appear as if its life will be a long one. ¶ Attendance at the services continue to be good. Report of “Haulover” and its filials for the year ending December 31, 1931. [...]"
Exerpts from Report of Haulover and its Filials for the Year Ending December 31, 1931, J. A. Fisher, Moravian Church, p. 2. "[...] 10. [...] but like at Kiha is much affected by a good many of the men especially the younger ones, having to go to load the banana ships at Puerto Cabezas on every Sunday. Here also the people are hard hit by the closing down of said Co. & other more remunerative activities. Foolishly too many had almost given up making their own plantations, hence the shutting down has caused the hitherto strong current of cash flowing regularly has gradually dwindled away till entirely dried up: thus causing not a few unable to meet their Church obligations. If that was put first, such would not have been the case, but we know with many it was always the last to be attended to, whilst self-denial is a virtue not very common amongst us here. ¶ At present it is not easy for a good many here to put their hand on what to eat, and it gets more serious every day. Pretty ugly for some it will be as I see for such according to conditions around. ¶ Clillna?.—I can say nothing whatever respecting this village. Never had the chance to pay it a visit during the year. Only heard that the small church being built there is finished all to complete—that it is expected to be dedicated in March; and about 12 is there under instruction. Ex-evangelist Ignatius who lives in Karata has temporary charge of it, the above information was given to me by him recently. [...]"
Intelligence, Col. L. L. Leech, Bluefields, to Jefe Director GN Managua.